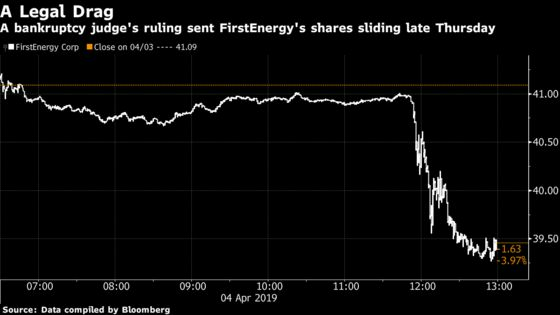 (Bloomberg) -- The bankrupt, money-losing unit that FirstEnergy Corp. thought it had washed its hands of last year has come back to haunt the U.S. power giant. Late Thursday, a restructuring plan that the FirstEnergy Solutions Corp. unit had carefully crafted with bondholders -- one that would’ve severed ties with the parent company and handed the reins of the business over to creditors -- was struck down in court. In his ruling, U.S. Bankruptcy Judge Alan M. Koschik said the plan would have unfairly shielded FirstEnergy Corp. from future lawsuits. The judge’s ruling is a blow to FirstEnergy, which has been counting on the restructuring to rid itself of a business that had weighed on the company for years. It planned to cut loose the competitive electricity generation business to focus solely on running regulated utilities that maintain pipes and wires after volatile wholesale power markets left some of its coal-fired and nuclear units bleeding cash. The company’s shares fell 4 percent on Thursday, the most since 2016. They added 2.7 percent to $40.50 at 9:56 a.m. in New York. FirstEnergy Solutions should be able to get its bankruptcy back on track by dropping the proposal to shield from future environmental claims its parent and other affiliates, which are not under court protection. The unit said Thursday it would adjust the so-called disclosure statement that Koschik rejected. The judge’s decision came at the next-to-last stage of the bankruptcy, when FirstEnergy Solutions was seeking permission to send the statement -- a plain-language outline of the plan -- to creditors so they can vote on the reorganization. Koschik would then take those votes into consideration when making a final decision. FirstEnergy Solutions’s collapse played out on a national stage as the Trump administration made unsuccessful attempts to bail out its foundering coal and nuclear plants. Robert Murray, a Trump supporter and the outspoken owner of a U.S. coal producer whose mines supplied FirstEnergy Solutions plants, had pressed for the federal government’s help, calling looming coal plant closures a national emergency. Now the utility owner is facing the prospect of a more prolonged bankruptcy case for FirstEnergy Solutions and potentially future liabilities. In rejecting the restructuring plan, Koschik essentially sided with environmental groups and government regulators who raised concerns about freeing FirstEnergy Corp. from environmental lawsuits that may surface later. FirstEnergy Solutions’s lawyers said they would review the judge’s decision before deciding how to proceed. The company could rewrite its reorganization plan to comply with the judge’s ruling about so-called third-party releases. FirstEnergy is just one of several power giants moving out of wholesale power markets as cheap natural gas and renewable energy resources have sent electricity prices plunging, squeezing their profits. Last year, the company announced a $2.5 billion equity investment by a group including Elliott Management Corp. to expedite its exit from the unregulated power business.